Terje Sørgjerd is an amazing photographer. He spent a week up in the Kirkenes and Pas National Park in Norway capturing a spectacular aurora borealis. Sørgjerd then put together his photos in a time lapse film that may be viewed HERE. One of the advantages of living in Northern North Dakota. 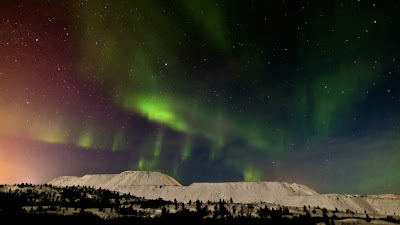 We can go out side and watch the Northern light for real. When they are "dancing" they show up better if you go out of town a little. But many a times they are so bright you could drive without your headlights. I never get tired of watching them. Thank you for sharing, Nate. When I clicked on it, the 'streaming' was awful. On less than one second, off for 2, on for one, off for 2. The audio was annoying. Guess I should have turned off the sound. Great pictures. I grew up in Fargo with those awesome lights. Glad to hear from Roger that they still have them. Thanks for showing us something a little different from our normal. The streaming was fine here - maybe a problem with your video codec, Judi?